Sugrue is the author of The Origins of the Urban Crisis, published in 1996 and lauded as the seminal work on the rise and fall of Detroit. He's also the David Boies Professor of History and Sociology and director of the Penn Social Science and Policy Forum at the University of Pennsylvania. Growing up on Detroit's northwest side, Sugrue remembers watching his neighborhood change from nearly all white to predominantly African-American. He spoke to The Huffington Post from the Philadelphia airport last week, shortly before an appearance at the annual Detroit Policy Conference (on this year's agenda: revitalizing the city's neighborhoods, diversifying the local economy and promoting a better relationship between the city and its suburbs). For years, Sugrue pointed out, Detroit's revitalization has largely been limited to improvements in the greater downtown area. "What does a city revitalizing even mean at this point? I'll tell you -- it means, is it appealing to better-off people, tourists and writers," he said. "The signs of a city's success are people sitting in outdoor cafes. It's beautifully landscaped streets. It’s new high-rises going up. It's restaurants." Detroiters line up outside the Whole Foods grocery store that opened in Midtown Detroit last June. Photo by Kate Abbey-Lambertz, The Huffington Post. 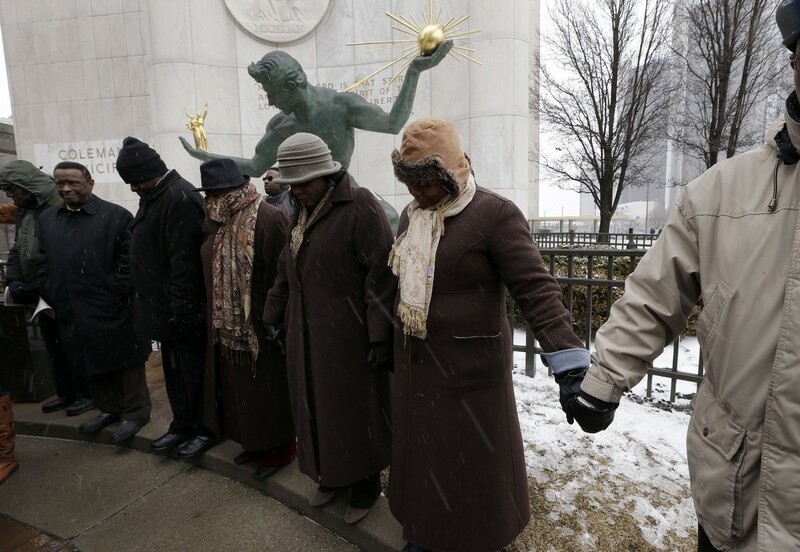 With a population that is 83 percent African American, Detroit is blacker than any big city in America. But black people might not be the ones whom revitalization is helping. Urban theorists like Richard Florida have long maintained that the key to rejuvenating a city is to attract young, creative professionals who will bring about economic transformation. But Sugrue says that in practice, this strategy only helps a select few, while leaving everybody else no better off than before -- a phenomenon he calls "trickle-down urbanism." "There’s not a lot of evidence that the tourism, downtown-oriented and professional-oriented urban redevelopment policies really grapple with the questions of how to provide stable secure employment for working-class and lower-income folks," Sugrue said. What "trickle-down urbanism" usually leads to, Sugrue said, is gentrification -- a hot topic in Detroit lately, due in part to the recent eviction of artists and musicians from downtown lofts owned by the development titan Dan Gilbert. "Gentrification" is usually used to describe the process of displacing residents from urban neighborhoods that have been targeted for new investment and resources. Rising housing prices mean that many long-term residents cannot afford these "rediscovered" neighborhoods. Detroit's population now hovers around 700,000 people. Thirty-eight percent of its residents live under the poverty line, and the city's median income is less than $27,000. The city has a persistent legacy of residential segregation -- metropolitan Detroit is the most segregated urban area in America -- which plays a role in many residents' anxiety about being physically displaced. At least 70,000 homes, or 20 percent of Detroit's housing stock, are considered to be abandoned or damaged beyond reasonable repair. Attracting wealthier residents and new businesses to the city is not without its benefits. It's helping to stabilize the city's tax base, for one thing, which means more money for essential services like garbage pickup, cops and firefighters. But Sugrue argues that any rescue plan for Detroit must include other elements often overlooked by creative-class visionaries -- things like revamping the public school system, creating jobs for the city's working-class and low-income residents, and "addressing the disastrous consequences of the prison-industrial complex, the expansion of the criminal justice system and its disproportionate impact on minorities." By cultural displacement, I mean a sense of place and community and feeling like you have the right to creating the vision for that community's future. Even if people are not forced from their homes due to rising rents, they may feel like their community is less their own than it used to be ... When certain types of people become more visible than others through our main media outlets, this strikes an imbalance that hits at the nerve of people's sense of place, their attachment to their communities, and their desire to keep Detroit as their home. While she admires Sugrue's work, Elliott said that the hipsters-take-over-Detroit narrative is one that ignores a lot of inclusive, beneficial work done by recent arrivals to the city -- widely appreciated initiatives like FoodLab Detroit, Why Don't We Own This and the 313 Project, among many other examples. Perpetuating a suspicion of outsiders could backfire, she says, and lead Detroiters to fear newcomers and shun sincere efforts to help. "Having the conversation in that manner reinforces those anxieties in people," she said. Elliott said she thinks new mayor Mike Duggan, who is white, can build consensus for Detroit's revitalization efforts simply by showing respect to long-term residents who have stayed in Detroit while so many others left. "A lot of long-term residents have just been disrespected in so many ways, for so long," she said. In last month's State of the City speech, Duggan announced a new Department of Neighborhoods that will target street-level issues affecting quality of life throughout the city. He also wants to devote more resources to Detroit's woeful transit system and freeze property taxes for homeowners in various neighborhoods, among other initiatives. These are changes that would benefit every resident, not just a select group. "I think everyone is open to change. That’s what makes this conversation interesting," said Elliott. "Everyone recognizes that things need to change here."